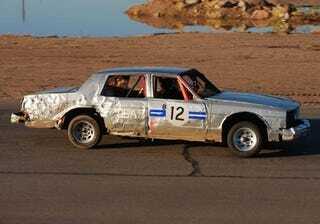 It's not often that a LeMons team owns the Index Of Effluency discussion from start to finish, but the Fortress 1978 Oldsmobile 98 Regency Brougham has accomplished the feat. For the 2010 season, the Index Of Effluency prize- given to the entry that accomplishes the most with the least- pays more nickels than the overall win: $1,501 versus the overall win's $1,500. General Motors continues its dominance of the IOE! Zero black flags, zero mechanical problems, and excellent lap times... all with an Olds 403 under the hood. Did we mention that they finished fifth overall? Congratulations, Team Fortress!